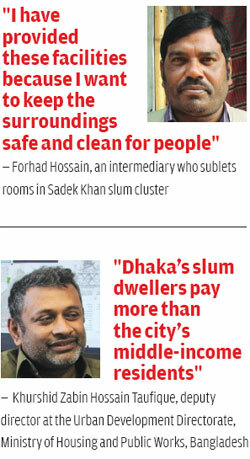 Dhaka has seen a sharp rise in privately owned slums. Are these a better alternative to 'squatter settlements' common in India? It's 11:30 am and the kitchen is abuzz with the sounds of lunch preparations. A woman watches as pieces of fish sizzle in a hot pan while another woman, an infant perched on her waist, stirs a steaming pot of rice. 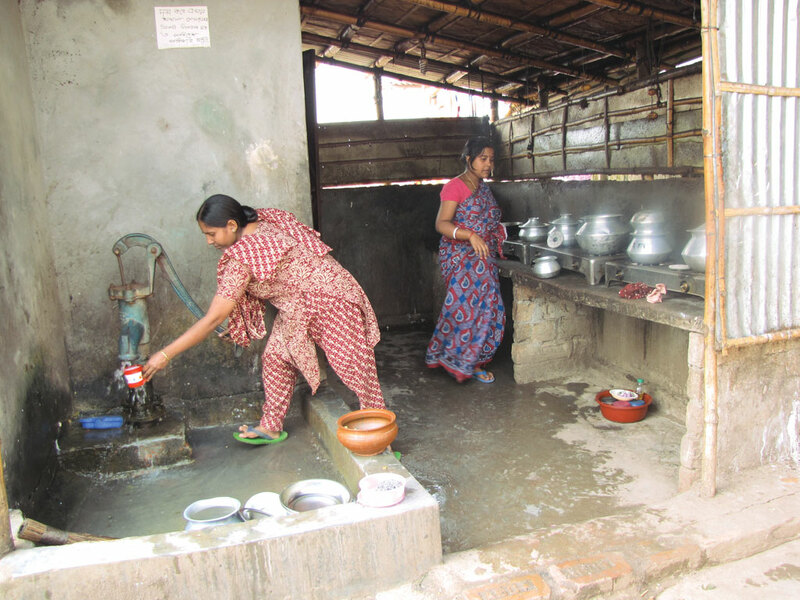 These are scenes from a communal kitchen in the Sadek Khan settlement, a densely inhabited slum on the western periphery of Dhaka, capital and the largest city of Bangladesh. Named after its politically influential owner, the slum is one of the city’s many privately owned low-income settlements. While Khan remains behind the scenes, those visible to the public are middlemen, persons to whom parts of the land have been sub-leased and who have played an active role in developing the settlement. When sub-lessee Forhad Hossain, a dealer in heavy equipment, got the lease four years ago, a slum already stood on his one hectare. The rooms were on stilts over a marshy area reclaimed from the Buriganga River. He had intended to start a factory on the land but changed his mind when he realised that transportation costs would render the business unprofitable. Instead, he decided to make gradual improvements to the houses to make them more profitable to rent. The marsh was filled with soil, providing a raised and level ground. The “hanging” houses were converted into two-storeyed structures with rooms on both floors. While the main bamboo-made structure was retained, brick-and-mortar pillars were added to provide additional support to the first storey. Floors were paved with cement to give them a pucca feel. Communal kitchens with gas connections and burner stoves, and toilets with water connections too were provided on both sides of the rooms. The role of private developers like Hossain has emerged as an important but hitherto neglected factor for urban planning in Bangladesh. Every year, 0.3-0.4 million people migrate to Dhaka from the country’s rural parts. With no structured government-backed housing scheme in place, a chunk of the poor migrant labourers are absorbed into the city’s slums. These slums are bursting at their seams, with the population density ranging between 80,000 and 180,000 people per square kilometre. Unlike many Indian slums which are “squatter settlements” on public land, the case of Dhaka is peculiar. Most land in the city is privately owned and with the few slums on public land having reached their maximum capacity, the urban poor are forced to live in privately owned settlements. According to the Centre for Urban Studies, a Dhaka-based non-profit, between 1996 and 2005, the proportion of slum households on private land rose from 48.8 to 70.3 per cent in Dhaka. A paper published in 2013 also acknowledges that private slum clusters in Dhaka are increasing. “It must be noted that the availability of land to squat on has significantly reduced in recent times. Not only has most available public land already been squatted, but political resistance to squatting has heightened significantly... This means that the bulk of new shelter needs must have been provided by informal private developers,” says Manoj Roy, lecturer at UK’s Lancaster University, in the paper published in Shelter, a journal of the Housing and Urban Development Corporation Ltd.
Slums on private land run on a market economy where facilities come at a cost. Until December 2015, Hossain’s tenants were paying 2,500 taka (1 USD = 78.5 taka) per month for a 3 x 3 m room and 1,800 taka per month for a 3 x 2 m room. When Down To Earth visited this slum in December 2015, the passage bore a notice announcing a 200 taka rise in monthly rent starting January 2016. 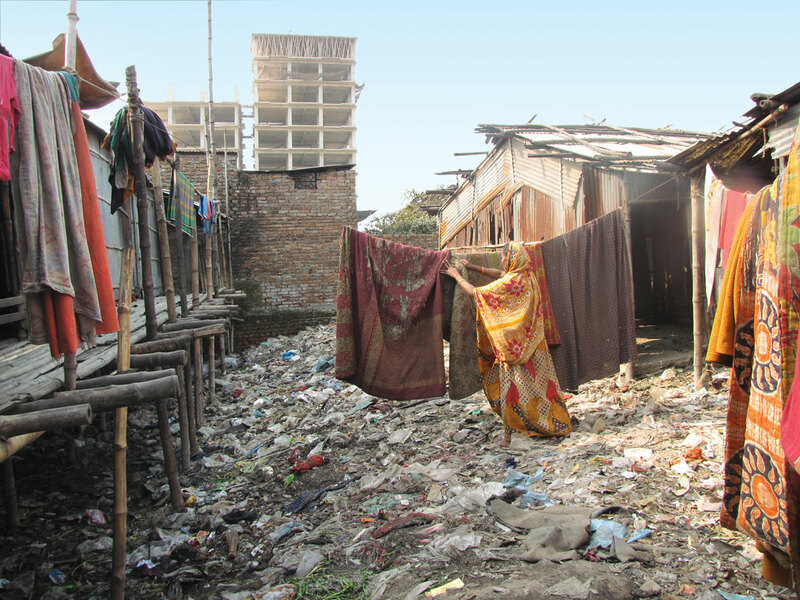 Dhaka’s urban poor lack access to basic infrastructure services. A 2007 World Bank paper on living conditions of the city’s poor says that 70 per cent of households under the poverty line do not have access to piped water. Ninety per cent do not have access to a sewage line. Only 43 of the 1,925 slums identified in the study are within 100 m of a public toilet. The lack of such services is evident in high infant and maternal mortality and child malnutrition rates prevalent in poorly managed settlements. While housing for all is a national goal, Taufique admits the government is doing little to provide quality housing to the poor. Initiatives to provide infrastructure to low-income settlements remain in text, he says. Slum integration projects of the National Housing Authority and Rajdhani Unnayan Kartripakkha (RAJUK or capital development authority) consist of apartment-style housing for the poor, but the flats are often grabbed by the rich and influential. Policymaking also suffers from the classic problems of lack of synergy between different agencies and political will. “After a draft housing policy was approved in 1993, we prepared three revised drafts—in 1999, 2008 and the latest in 2012. These drafts had proposed social housing which means the government would build houses for the poor, instead of private players. But such a proposal will never be approved by the government,” Taufique says. Direct intervention of the government may, however, not be feasible in the current context, says Roy, who is also principal investigator for EcoPoor, a UK government-funded project on the urban poor’s access to ecosystem services like safe drinking water and sanitation. “Most slums are located on wetlands according to old master plans and were never earmarked for development. Hence, there is no formal agency to take responsibility for them,” he explains. Too much government intervention may also destroy the private low-income housing market, he points out. Private developers are not providing shelter out of social responsibility, but are only biding their time until they get better rates for their land. “If Bangladesh sets too many regulations protecting the slum dwellers’ right to live on the land like in India, the private developer will simply not construct these low-income shelters. This will be dangerous because neither the government nor non-profits are addressing the problem of housing for the urban poor,” Roy adds. The city’s population is projected to touch 20 million by 2020 and the urban poor are estimated to outnumber the rural poor in Bangladesh by 2040. With such exponential growth, the ability to strike a delicate balance between social well-being and market economy will be a key skill for policymakers.